Suit your player screen resolution. 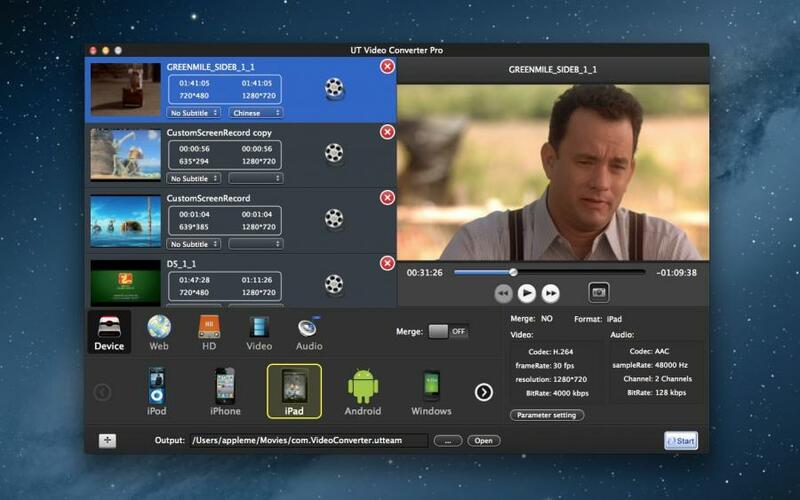 UT Video Converter Pro can convert both DVD and all popular video formats in one app. You not only can convert the video files into other formats, such as MOV, FLAC, MP3, MP4, WMA, FLV, AVI, PSP and so on, but also can rip the DVD movies into the video or audio in any formats you want. 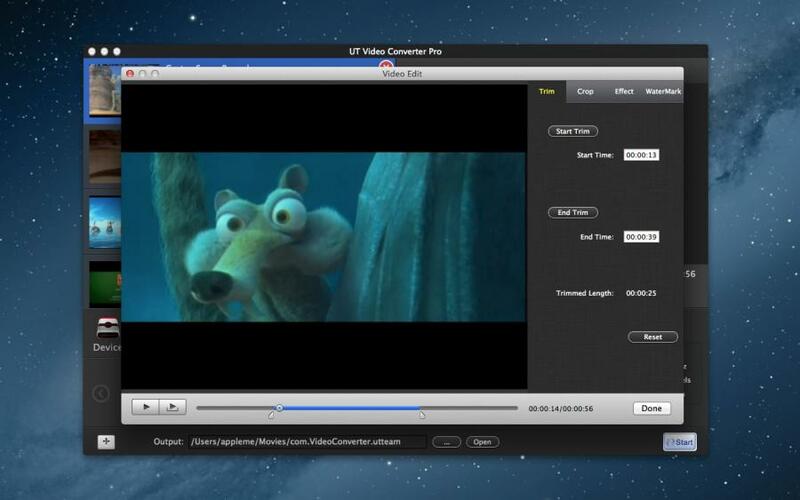 UT Video Converter Pro lets you quickly and simply convert your video, audio files and DVD Folder to all popular formats. lets you apply advanced custom settings (bit rate, sample rate, etc.) and you can even create and manage your own presets, you can merge multiple files into one. 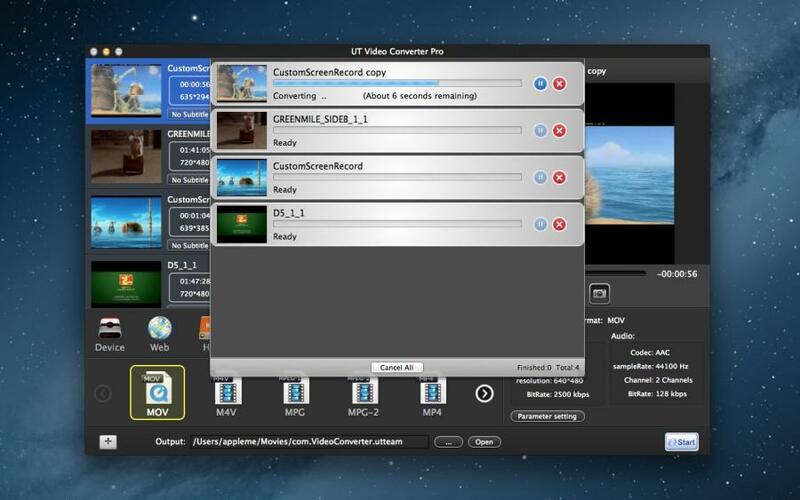 UT Video Converter Pro can convert different video (Common Video, HD video, camera video, web video), DVD and audio files for importing to sorts of portable device, applications and website, such as iPad, iPod, iPhone, Apple TV, PSP, iTunes(mp4, mov), iMovie(mp4, mov), YouTube , etc.It’s the easy way to make your Mac friendly with all audio and video formats. ➤ Convert DVD from: DVD Folder(VIDEO_TS), DVD ISO, dvdmedia file, DVD Disk. ➤ Convert Video from: ts, tp, trp, mts, m2ts; mpg, mpeg, dat;mp4, m4v; 3gp, 3g2, 3gp2; rm, rmvb; avi, dv; mov, mod; flv, f4v; mkv; wmv; asf, nsv, evo and many more. ➤ Convert Audio from:mp3, mp2, ac3, mpa, wav, mka, wma, flac, aac, ogg, aif, au, mpa, aiff. ➤ Convert to device: iPod, iPhone, iPad, Apple TV, PSP, PS3, Android, Mobile Phone, Portable, Youtube, HD. ➤ Convert to Aduio: MP3, AAC, M4A (Apple Lossless), M4R (iPhone Ringtone), FLAC, WAV, WMA, OGG, MKA, AU, CAF, AIFF, AC3 and more. ✓ Convert DVD Folder, DVD ISO, dvdmedia file and DVD Disk into video. 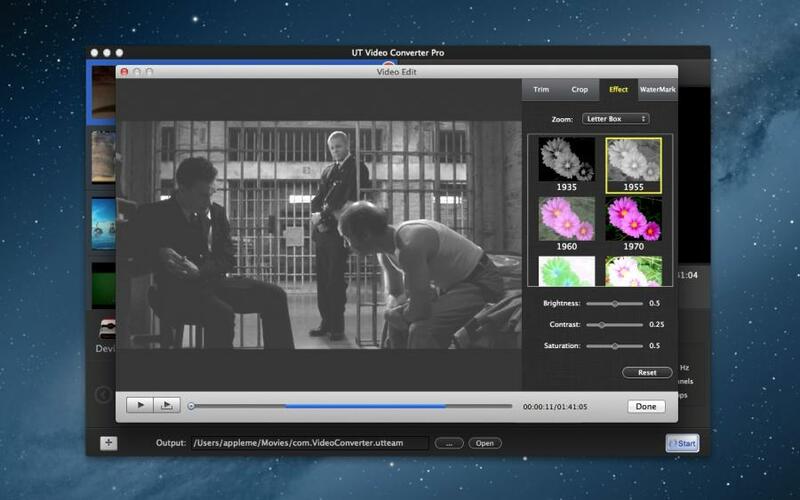 ✓ Convert HD video formats to other HD video formats. ✓ Convert between audio formats. ✓ Helps you to crop video, trim video.